Like a lot of people, Bear and I ditched cable a while back and, for the most part, have no complaints! Not having a huge bill is the greatest perk, of course, but so is discovering new shows. This can go either way and, if we’re being honest, at least 20% of what we queue up is for hate-watching; have you re-watched any early 90s cooking shows lately? Hilarious…and also a study in food trends. Ah, the days when the portobello mushroom was “exotic,” as I recently heard it referred to or how we watched an entire show dedicated to the “wonders” of basil. I die. Recently, our hunt for new shows of the cooking variety brought us to The Great British Bake Off (GBBO) series, which airs on PBS. Oh my god, you guys, we have lost the last three weeks to watching every single episode in all five of its seasons! It is so, so good! GBBO is a baking competition that follows 12 amateur home bakers through 10 weeks of challenges. Sounds familiar enough to U.S. cooking competition shows, yes? Well, that’s about where it stops. GBBO is wonderfully antithetical to anything you’ve watched on the Food Network or Fox. It is believable, first and foremost, and the most impressive part about it is how genuinely invested the contests and judges are in the skills and in each other. There’s no “Welcome to the Thunderdome!” element to it, no sabotage, no surprise twist ingredient. It’s just an honest competition with lots of talent and two totally delightful co-hosts. I’m so sad we’ve watched, literally, all of it. Good thing Season 6 starts in just a few months! Eee! After watching five seasons of GBBO though, you can imagine that there’s a strong impulse to bake alongside the contestants and try out the (new-to-this-American) confections. 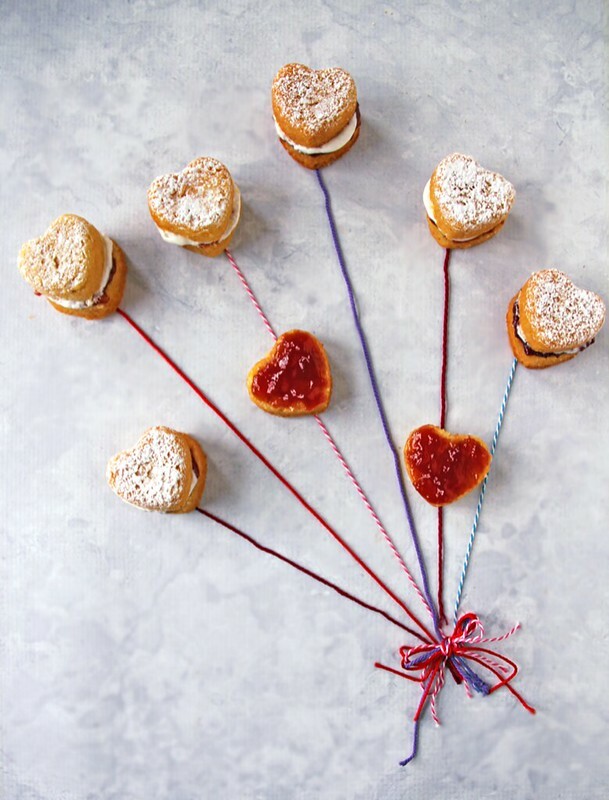 Season after season, it seemed as if each had a challenge where the bakers had to make classic Victoria sponge cakes (also called Victoria Sandwiches), a double-layer vanilla sponge cake filled with homemade strawberry jam and whipped cream, and named for Queen Victoria herself. While I was tempted by more complex undertakings, such as brandy snaps and mille feuille, it was the simple Victoria sponge cake I most wanted to try. 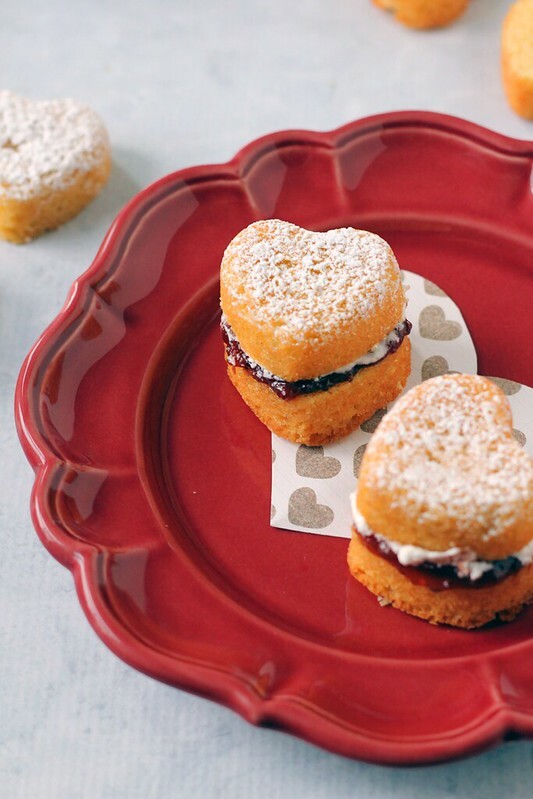 Traditionally, the batter for Victoria sponge cakes is evenly divided into two 8″ round cake pans, but with Valentine’s Day right around the corner, I couldn’t resist using my heart-shaped muffin tin. I think I chose right! 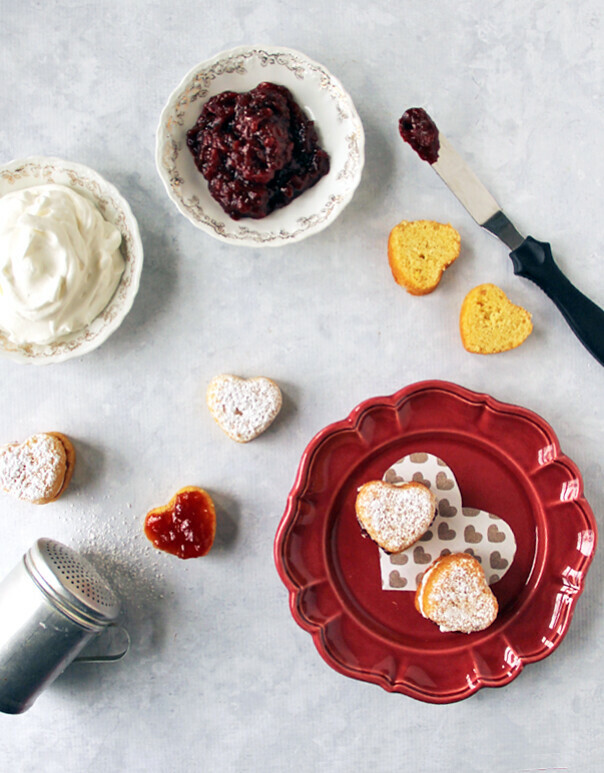 In tins such as mine, one batch made 24 mini cakes, which is perfect if dividing into small gifts, favors, or serving them alongside afternoon tea, as intended. Of course, these will taste just as delicious as a large two-layer cake in proper English tradition. Yields one 8-inch double-layer cake or 24 mini layer cakes; recipe only slightly altered from here. Preheat your oven to 355°F. Prepare your tins. If using two 8-inch round tins, cut a round of parchment for each. Butter the bottom of the tins lightly and then lay down the parchment rounds. use remaining butter to spread all over the top of parchment and all around the interior sides of the tin. You may wish to add a slight dusting of flour to these as well for easier removal. If using muffin tins, liberally butter each hole, as well as the area in between each section in case they bake up over their individual spot. In a medium mixing bowl, combine the butter, 1 cup of sugar, flour, eggs, baking powder, vanilla extract and salt. Blend with a hand-mixer until just combined. Do not over-mix or your cakes may sink. Fill your tins evenly and gently smooth the tops with a butter knife or a cake spatula. If you are using muffin tins, each hole needs only to be filled about 1/3 of the way. Place cakes in the oven and gently shut the door. Two 8-inch rounds will take approximately 25 minutes, while those in muffin tins will take approximately 15-20 minutes. Cakes are done when they are lightly browned, pulling away from the sides of the tins, and spring back with a gentle touch. Allow cakes to cool in their tins for 5 minutes once removed from the oven. Next, transfer to a baking rack and allow to sit until they are cold. When ready to prepare your cakes, pour 1 cup of heavy cream and three tablespoons of superfine sugar into a medium bowl and blend with a hand-blender or a whisk until whipped peaks hold their shape. Under-mixing will cause the whipped cream to ooze out of the cakes once sandwiched and over-mixing will turn the cream to butter. If you are baking the traditional 8-inch, two-layered Victoria sponge cake, place one layer upside down on a cake plate and spread as much, or as little, jam as you’d like on the top. Repeat with a layer of whipped cream. Affix the top cake layer top-side up and dust generously with powdered sugar. If you are using a muffin tin, slice each cake in half horizontally and fill as described above. Dust with powdered sugar. Store cakes in the fridge for up to 5 days. Of the three Valentine’s Day 2015 Gift Guides I’ve done over the past few weeks (check out gifts for your main squeeze & gifts for your BFF! 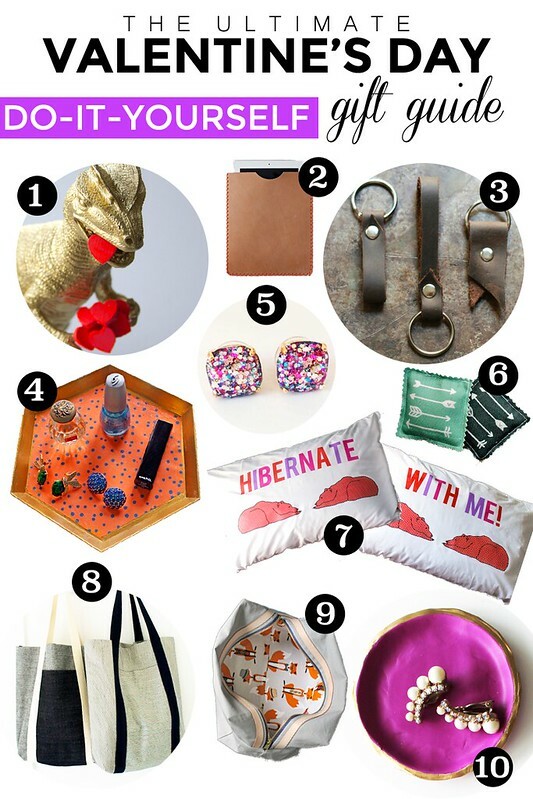 ), this one is my favorite – Valentine’s Day DIY Gift Guide! I’ve combed Pinterest, my favorite blogs, and my own archive (Shameless! Absolutely shameless!) 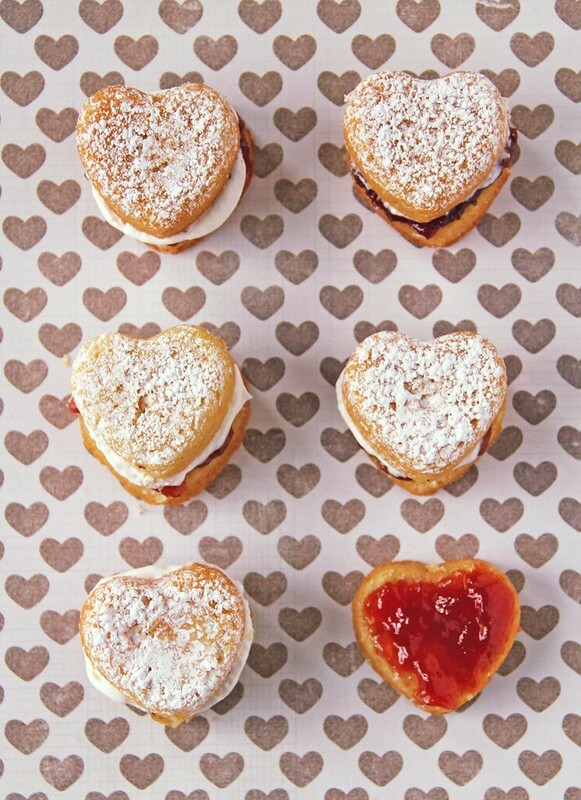 to give you the best suggestions for how to make Valentine’s Day a DIY affair this year. With budgets, skill levels, and genders in mind, I think you’ll find this gift guide all you need for making your boo, bae, or bff something special that reminds them of your love and care all 365 days of the year. 1. This DIY Dino Valentine from Lovely Indeed is one of my most popular pins throughout the year. I think what makes it so instantly beloved is the transformation that occurs when you gild something ugly (or ferocious, in this case!) and turn it into something fancy! An ordinary dinosaur toy isn’t anything to look at, but with some gold paint and tiny arms filled with hearts, there’s nothing not to love! 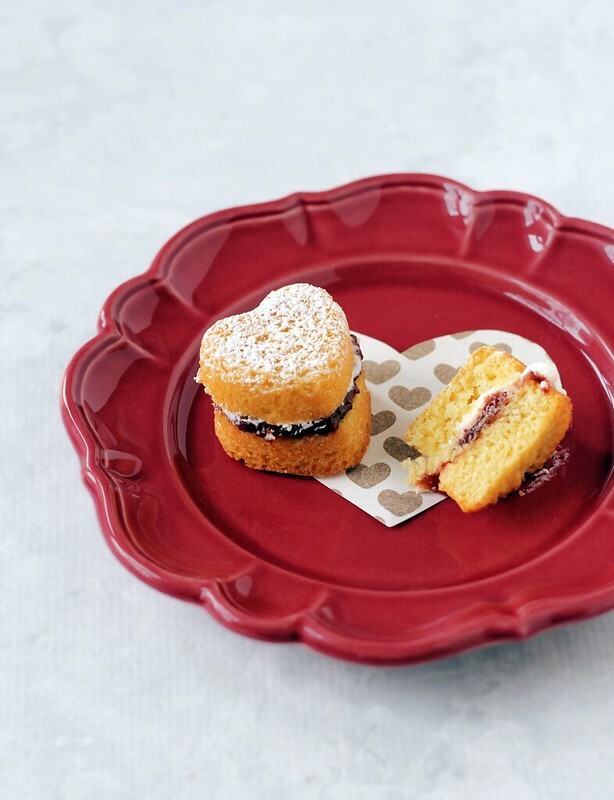 This DIY is quick, easy on the budget, and something your valentine will love regardless of age and gender. Imagine leaving this on the desk of your best officemate? Cu-ute! 2. Working with leather is such a popular trend right now and it’s definitely something I want to try in the future. This DIY leather iPad case tutorial from Martha Stewart also features instructions for a wallet, mouse pad, and pencil case, so the sky’s the limit! 3. For the past two years, Bear has added DIY leather key chains to every single list I keep for blog ideas on my desk, phone, computer, or elsewhere. It’s a new year, so I guess I’d better take a hint. This simple tutorial from 17 Apart includes plenty of photos to guide you in creating these functional little charmers. If you want to get fancy, grab a letter and number stamp kit and customize your key chains with initials or a meaningful date. 4. These DIY vanity trays are so quick, cheap, and easy, but look really luxe! They’re one of my most popular DIYs on the blog and have been featured in various spots online. Most recently, these beauties made it into a feature on Elle Decor’s website as one way to spruce up your bedroom in less than an hour. If they’re good enough for Elle, they’re good enough for your valentine! 5. Did you tragically miss out on the gorgeous Multi-color Glitter Stone Stud earrings that Kate Spade carried over the holidays? Me too. If I’m only drawing your attention to this bad news now, I’m so sorry. Not to worry though! This ingenious DIY from Shore Society will have you armed with a pair for your valentine (or yourself – I wouldn’t be able to resist!) in no time and, truly, they look as good as the originals. I’m in love! 6. If your valentine is experiencing winter in a colder climate, these DIY hand warmers are an adorable, loving way to tell someone you think they’re hot! Minimal sewing skills required and the designer, Rae, has even included a printable card to include with the hand warmers explaining how to heat and, well, handle them. Such a thoughtful gift! 7. 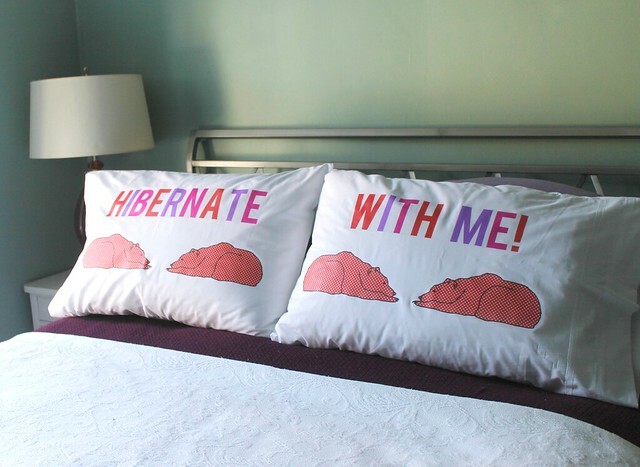 My Hibernate with Me pillowcases are one of my favorite DIYs ever and I’ve made it so easy for you with images and text you just download and print. Grab some photo transfer printer paper and your iron and you’re in business! These take just a few bucks and less than an hour – they’re beloved by…everyone! 8. I spend so much time ogling projects put out by the contributors of the Purl Bee, the blogging spot from the creators of Purl SoHo, that it’s a wonder that I, myself, am not so much better at knitting, crocheting, and sewing. Truly, I’m a disaster. This Railroad Tote is a fantastic example of why I keep coming back to their site, though – it’s current, super useful, and a project I feel confident trying because of their awesome, step-by-step tutorials. I love that this tote appeals to the masses both in its style and function – what valentine of yours doesn’t need an extra place to stash their stuff or carry home their groceries? 9. The title of this DIY toiletry bag on Polkadot Chair is “Dad’s Travel Bag,” but this case is great for anyone, of any gender, when they’re planning to be out of town. I especially love that creator, Melissa, used such a bold, fun fox pattern on the inside to give it a little something special. This is a perfect Valentine’s Day gift for long distance loves – whether they be boos or friends – to remind them how much you look forward to their next visit. 10. Can you tell I really value organization and things having their place? Here’s a great tutorial for these adorable DIY clay jewelry dishes from Hello Natural. Aren’t they just so sweet with their scalloped edges and bright, bold paint job? These would be great paired with a set of scented tea lights candles so your valentine can use them as a candle dish to light up their bubble baths or in any other part of the house. For a finishing touch, wrap the metal exterior of the tea light with a washi tape that coordinates with the colors you chose for the dish. Instant hit! I hope these DIY gifts inspire you and make you a hit among all your many loves for the big V-Day. You’ve got two weeks to go – get crackin’, lovies! 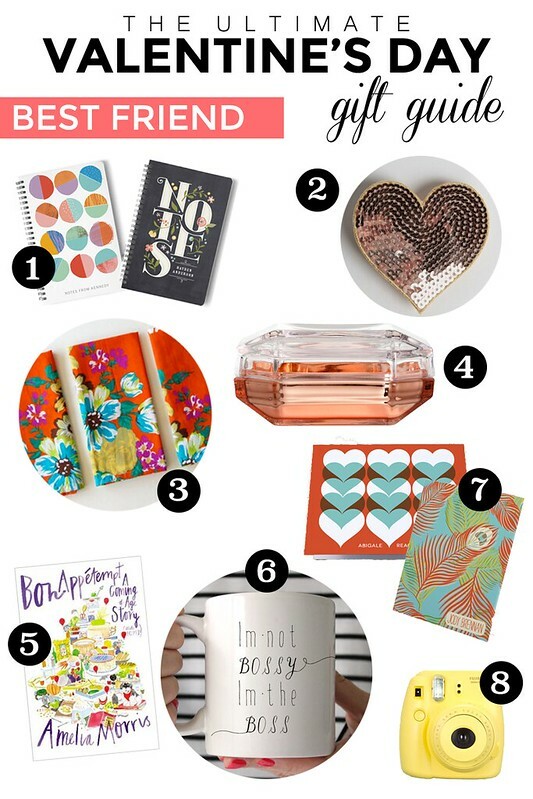 As promised, I’m posting today with a Valentine’s Day Gift Guide for your Best Friend…or, you know, any friend that you want to show a little love for this time of year. Some of very best Valentine’s Day memories are shared with friends, especially one where a feast was prepared that ended in chocolate lava cakes! Such good memories and, truly, reminders that friends can be the greatest loves of your life. I feel that way about a few of mine. My gift ideas here span budgets and interests, but I’m particularly drawn toward the cotton napkins from CuteBrightThings for any friend or loved one that likes to cook and entertain. This orange floral set is so bold and gorgeous and at $18 for four, it’s a great gift idea. I’m also loving the jewelry box in bronze from H&M. It comes in a few colors, but the bronze is so pretty and chic. Who doesn’t need an extra holding spot for all of their baubles? Amelia Morris’ cookbook is another idea for the cook in your life, but it’s also supposed to deliver a really lovely story. It comes out next week and I absolutely cannot wait. I’ve been a reader of her blog, Bon Appétempt, for years and her writing is always funny, familiar, and touching. I haven’t bought a cookbook in a long time – I mostly check them out from the library – but this is definitely one I’ll be buying for myself and a friend! What are you gift ideas for friends on Valentine’s Day? Do you have any friend memories from V-Day’s past? Valentine’s Day is upon us once again, which means many of us are searching for a creative way to make someone we love feel special on February 14th and, really, all days of the year. While I can’t imagine anyone turning their nose up to any kind of candy or flower, a homemade project is a safe bet in getting your point across that you’ve got ALL.THE.FEELS. for your loved one. More than making something adorable or pretty that I know my sweetheart or dearest friend will appreciate, I’m all about also making sure that item is useful. No one needs an extra something – no matter how whimsical – to sit on a desk collecting dust, am I right? Last year, I jumped on the ever-popular bandwagon of making long distance love mugs with Sharpies for two of my beloved friends on opposite coasts. They were a huge hit and inspired copious selfies drinking coffee out of our coordinated drinkware sent to each other via text. This year, I wanted to make something that was more romantically inspired; something you could gift to your boo(s), or the sweet thing you’re out to woo. 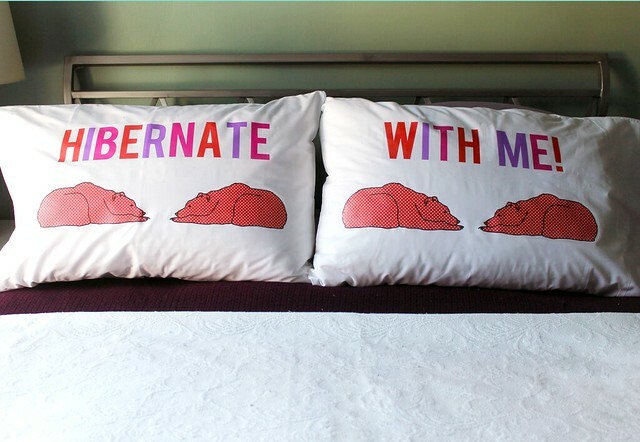 Being that Bear is the apple of my eye, I started brainstorming ideas from there and eventually got to here with these ‘Hibernate With Me!’ pillowcases. These might look tricky to the less tech-savvy among us, but fear not! I’ve taken all of the work out of this for you and hooked you up with each and every one of the images you will need to re-create these beauties. All you need to do is download them, hit “print” on your printer and do some light ironing. Full deets to follow below! First things first, it’s a miracle I even came up with a concept so adorable – “Hibernate With Me?” Come on! That’s so cute! I am *the worst* at coming up with slogans or catch phrases for things. If you knew how many ideas I went through before I named this blog, you’d pat me on the head a few times in second-hand embarrassment. I must have had the right amount of orange juice the morning I remembered that bears, in fact, hibernate – not to mention that ‘hibernating’ with a sweet someone is something most people want out of their Valentine’s Day! – in order to come to this, but when I did, I knew it had staying power. I decided to use this idea on pillowcases for a few reasons, but mainly the first two that come to mind: 1) they suggest bedroom time with your sweetheart and 2) they’re an inexpensive option as opposed to creating a set of throw pillows. Maybe that last point is gauche when it comes to creating a gift, but I’m a thrifty girl who likes to keep an eye on her spending and DIY pillowcases make for an adorable, affordable choice. After considering a few options, like painting the lettering or using those fuzzy sew-on letters, I decided to look into the option of iron-on transfers and found that Avery makes some pretty highly regarded transfers that you can run right through your printer. Once I knew how I was going to execute this project, I focused on finding an image to accompany it. I wound up free-handing this one based on some examples I saw online and then, wanting to keep with a bright, cheery look, chose a simple red polka dot pattern to fill the bears with. My last decision was selecting a font in a trifecta of valentine-themed colors to really make things pop. After flipping the images horizontally in Photoshop (you have to print their mirror images so that when you iron on the transfer it reads correctly from left to right), it was an easy print on my standard inkjet, and then just a matter of cutting out the pieces and aligning them accordingly onto the pillow cases before hitting them with the iron. A little bit of patience is needed for these. You’ll want to use a ruler and be deliberate in checking that you have the images centered and equal on each case so that when they’re side-by-side they read as a set. The arrangement and the measuring is, in all honesty, the most time-consuming part of the whole process and that’s pretty much 10 minutes if you’re being extra careful. Follow the instructions that come along with the transfers for the best results; I had only one spot where one of my letters didn’t fully adhere and I just gave it some more heat and pressure before it set perfectly. Can’t you just imagine throwing open the bedroom door for your valentine to these propped up on your bed? It’s ok if you have to fan yourself thinking of the reaction it might cause. 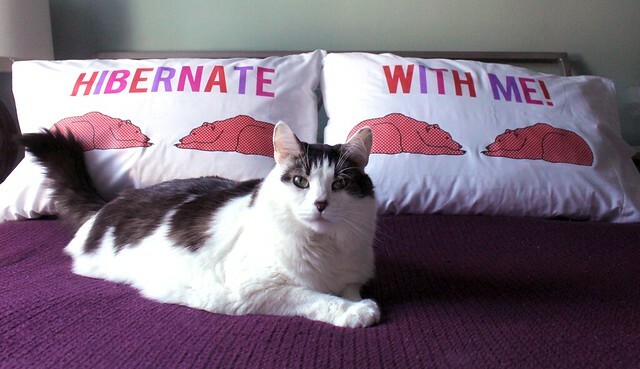 These pillowcases are sure to make anyone see hearts…just ask our meow, Ollie. He’s totally ready to hibernate. Like, anytime, all the time. Read the instructions that come with the fabric transfers very carefully. Set iron to highest cotton setting and turn off steam feature. Allow to warm up for at least 5 minutes. After downloading the bear & text images, do a print preview of the images to make sure they’re scaled to the page and then print them according to the directions from Avery and set aside. You should print two bears that face left, two that face right, and one copy of each text image. You will notice that two text images are written backwards. This is correct. You need to print the text as a mirror image in order to have it read correctly when transferred. Iron pillowcases lightly to rid of wrinkles and allow to cool. Cut out the bears and text images. Because of the size of the printer paper (8-1/2″ x 11″), you will need to cut the “Hibernate” out in two halves – hiber & nate – and align and affix together on the pillowcase. You will need to do the same with aligning the “With Me!” I chose to cut out the entire words and not each individual letter so that I didn’t have to worry about aligning all of the letters individually. Work on one pillowcase at a time. Find the center of your pillowcase and arrange the bears as you see fit. Again, following the instructions from Avery, apply the heat and pressure of the iron to affix the bear transfers. Allow to cool as you measure and align the “Hibernate” above. It may help to keep a note to yourself with how many inches in from the edges the bears are, how many inches are between the top of the bear and the bottom of the word, etc., so that you can easily apply these same measurements to the other case. Once your “Hibernate” is aligned, apply the heat and pressure of the iron and then allow to cool. Replicate this process with the second pillow case. Allow both cases to cool before use. Wash inside out and on delicate or by hand for longevity.